Dallas Area Rapid Transit (DART) is currently evaluating the possibility of offering Midday On-Call Services. The earliest that DART could potentially provide the service would be the fall of 2014. 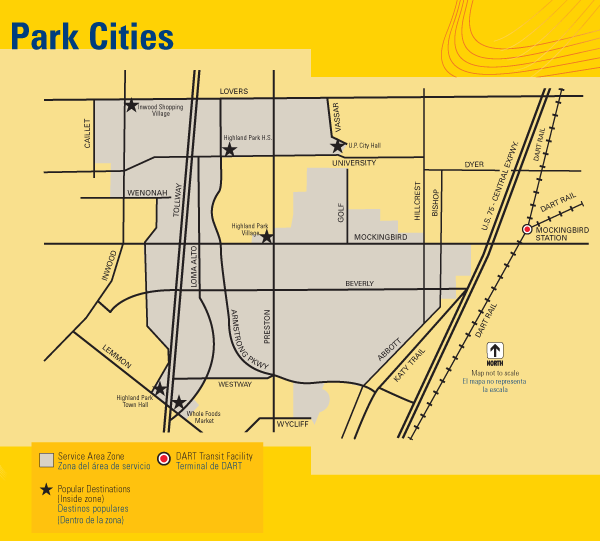 Adding Midday On-Call Service in Highland Park must be approved by DART's Board of Directors with funding allocated in its operating budget, which is not normally complete until August, 2014. Midday On-Call service allows patrons to call and reserve service up to a week in advance during off-peak hours anywhere within the On-Call Zone. On Call Service extends to all of Highland Park and specific areas within the Park Cities zone.